Cuba is revolutionary: for her politics and for her worm farming; albeit her worm farming revolution is not so well known. Often heralded as a nation that has already once survived peak oil, by necessity Cuba has come to be known as a global leader in the organic movement. Worm farming played a key role in that remarkable story. Whilst undertaking my Winston Churchill Memorial Trust Travel Fellowship in 2016, Cuba was naturally the number one destination to explore, representing the possibilities and ability of a nation to thrive in the face of adversity with a little help from the humble but mighty earthworm. The collapse of the Soviet Union left Cuba suddenly without 80% of its imports in synthetic fertilisers, 50% of its oil and 53% of its food imports. Referred to as the “Special Period in Peacetime”, the crisis inflicted wartime-like rationing conditions on the country, seeing the average Cuban losing 20lbs in weight. Prior to the collapse industrial sugarcane farming took precedence over food production and agrochemicals were being applied in quantities double to that being used in the USA at the time. These practices resulted in soil erosion, compaction, salinization, water logging, pest resistance and environmental contamination (Rosset & Benjamin, 1994). A rapid shift in agricultural practices, implemented through government led initiatives and education programmes, resulted in 172 vermicomposting initiatives being established by 1994. The advent of vermicompost realised a highly efficient method of agriculture where four tons of vermicompost replaced the need for forty tons of cattle manure per hectare. Urban agriculture provided the foundations for food security for city residents without readily available fossil fuel for transportation from the countryside. Urban spaces, including redundant car parks, were transformed into Organicoponicos; intensive urban farms. In Havana alone 7,718 hectares of land is under agricultural production, with 90,000 urban residents involved in some form of agriculture. Irrespective of the cultural and political differences, the UK shares Cuba’s island demographic, highlighting the fragilities of dependence on food imports and synthetic fertilisers. Cuba models the potential for conversion from industrial energy-intensive agriculture to a low input organic model. and the collapse of the Soviet Union there exists a deep culture of community. Without this culture it would be difficult to realise a peaceful transition to a resource-scarce society. Socialist governance evidently played a key role in assisting this transition through education, access to communal land for food production and by importing over a million bicycles from China. Fortunately for Cuba vermicomposting was introduced in 1989, shortly before the collapse and now is understood as a recognised component of mainstream food production, and was promoted as such in government guidance manuals. For a nation to thrive in adversity there must be in place governance that acts upon the best interest of the people, not purely in the interest of economic growth. Today there is a shadow looming over this organic worm-powered revolution. For the past ten years there has been a shift in agriculture in Cuba with a return to the use of agrochemicals and the introduction of genetically modified (GM) seeds in 2008, raising concern over future food security and food sovereignty. As a socialist government in control of the majority of the island’s land, if political forces advocate for fossil fuel-dependent, high input farming practices it leaves little room for negotiation. Fears of the cross contamination of seed undermines diversity and resilience, leading towards monoculture and the monopolisation of the food supply. 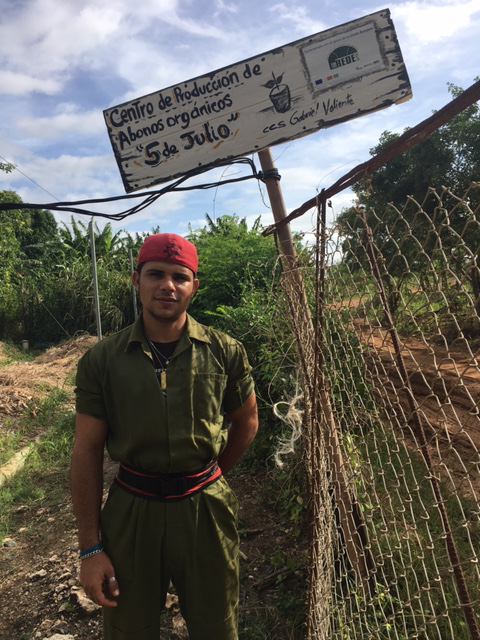 Despite the concerning shift in government-supported agricultural practice in Cuba, reminding us of humanity’s bad habit of easily forgetting the mistakes of our history, there remains a strong organic grassroots movement. The experience of Cuba teaches us that a reorientation to sustainable agriculture is achievable, with political will to support and mobilise citizens. Adopting integrated agriculture techniques with livestock and crop production is key, and ultimately harnessing the vermicomposting process to convert valuable animal waste into a superior fertiliser and compost. 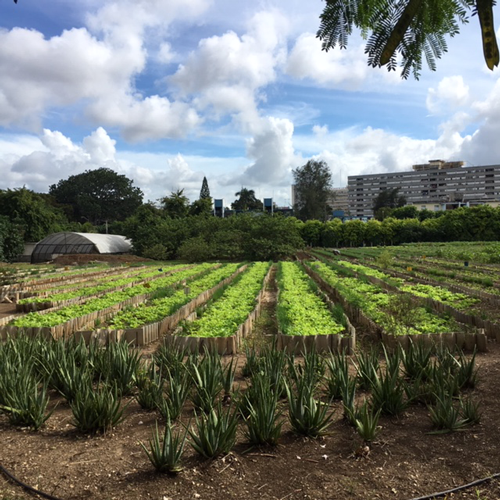 In Cuban cities urban agriculture continues to thrive, not only empowering urban food security, but building community: and surviving in a resource-scarce world requires united action. For Anna’s full report from her research trip funded by the Winston Churchill Memorial Trust and the Royal Horticultural Society, please follow this link.